Easter is just around the corner and I’m here to help you remember the feline members of your family when shopping for holiday goodies. We recently decided to try Purina® Pro Plan® SAVOR® Shredded Blend Adult Cat Food with probiotics so I thought we’d add a few fun toys and make it a party. 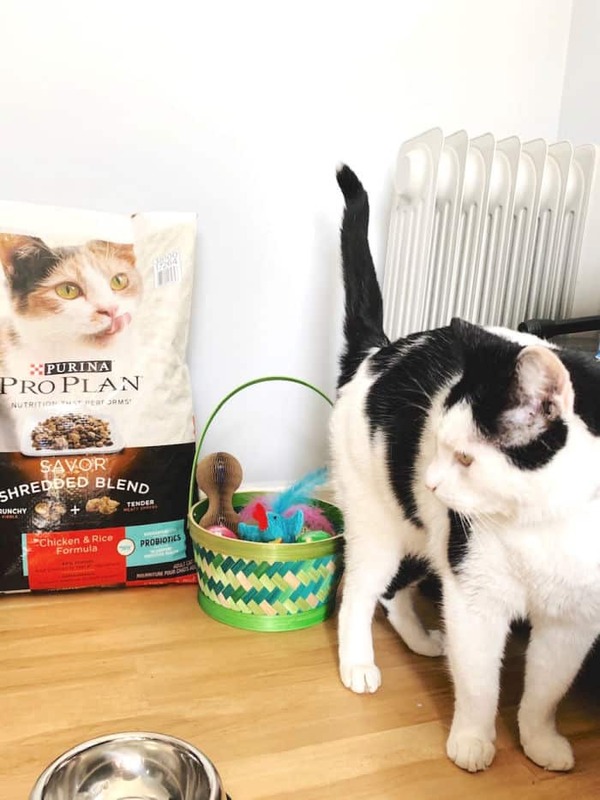 Check out my easy pet Easter basket ideas and see what we love about their new cat food! Don’t forget about the pets this Easter! Whether you are transitioning your kitties to a new cat food or simply refilling your pantry, why not throw in a few toys? The truth is, cats need to play. How do I know? Because they wake me up in the middle of the night chasing each other around the house. It’s good exercise for them sure, but I’d rather they have a few toys to play with at 4am. That’s just me. We’ve experimented with a few cat toys and our guys definitely prefer feathers and scratching pads to balls and bells. There are some good deals right now at Pet Supplies Plus so grab a few if you aren’t sure. 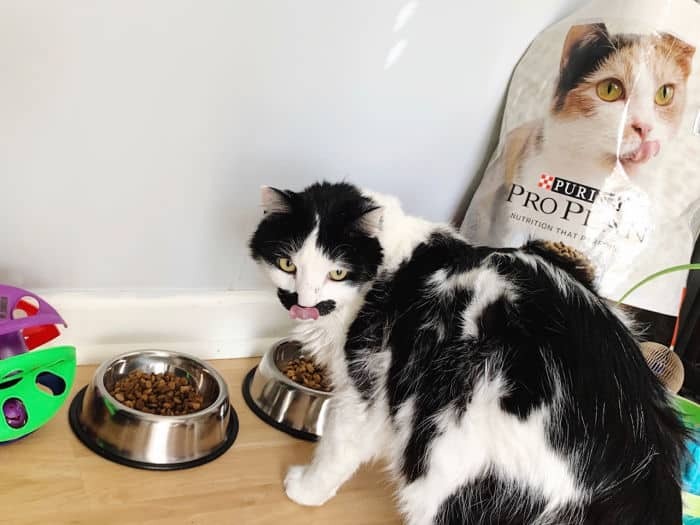 Since we are transitioning to the new Purina® Pro Plan® SAVOR® Shredded Blend Adult Cat Food with probiotics, I thought new food bowls were in order because why not? 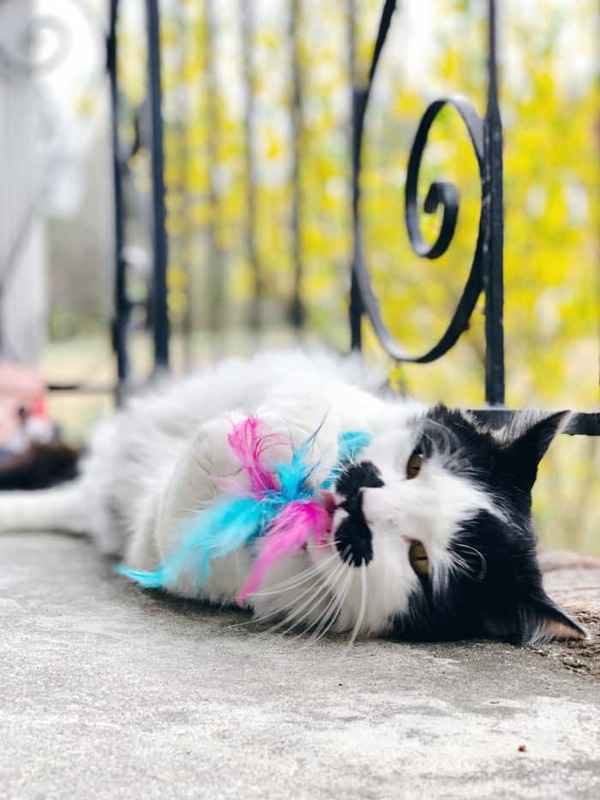 If you want to create your own cat toy, there really isn’t anything easier than tying a few feathers with a string and dangling it from a stick. Just be careful of your fingers when you play. Those kitty claws are sharp! Since cats can’t really unwrap anything there rest is pretty easy. Of course I had to put everything into an Easter basket because I’m extra like that. It was fun to watch them check everything out and sample their tasty new cat food. 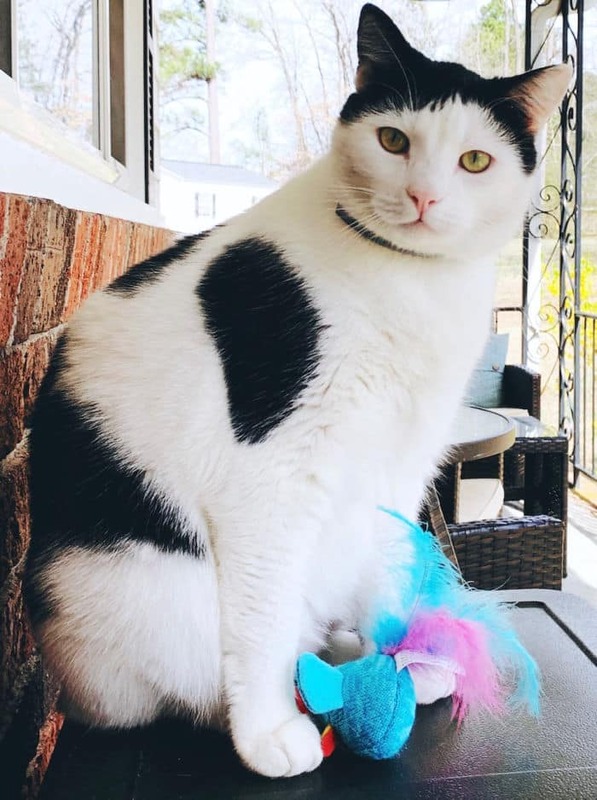 We’ve been using Purina® for years but what I didn’t know is they have been fueling pets since 1986 and there is a money-back guarantee if you need it. 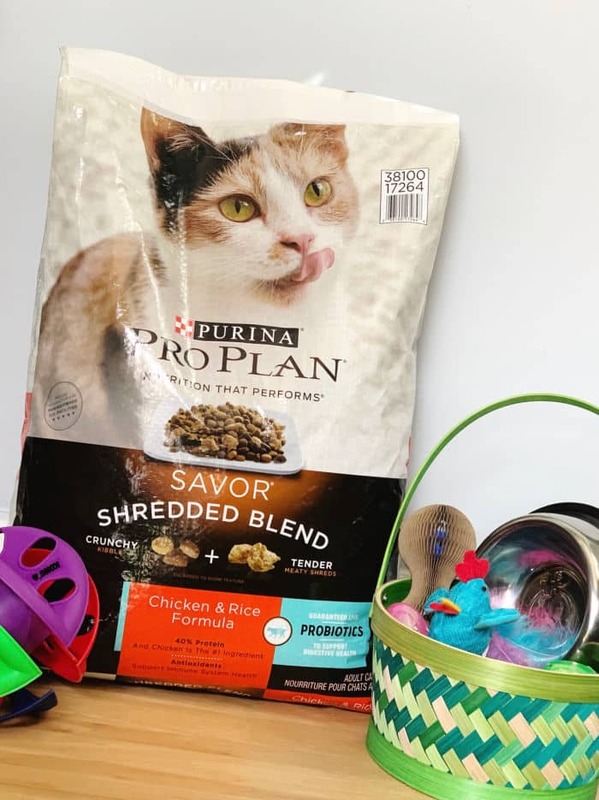 If you want to add Purina® Pro Plan® SAVOR® Shredded Blend Adult Cat Food – Chicken & Rice to your pet Easter basket, you can find it and lots of toys at Pet Supplies Plus in the cat food aisle. I love having a Pet Supplies Plus nearby and did you know you can even bring your pet with you when you shop? I opted to leave the cats at home but I saw plenty of dogs in the store and even a couple reptiles! They also have a really great loyalty program that always saves me a few dollars when I go. 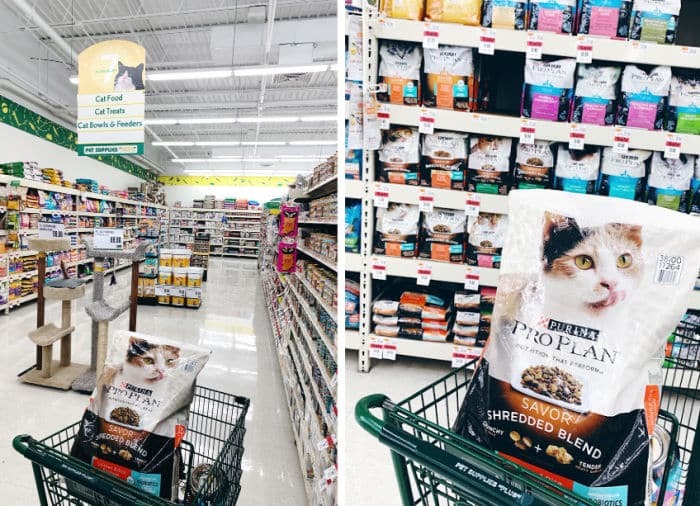 This food has 5 dry formulas with guaranteed live probiotics to support your cat’s digestive health that are made with at least 38% protein to help meet a cat’s unique nutritional needs. I’ll be honest that I never really considered gut health when it came to our cats but my family benefits from probiotics so I bet the kitties will too. Pro Plan® SAVOR® has guaranteed live probiotics to support digestive & immune health and I’m glad we have the ability to help them feel Thor best. Have you given your pets probiotics? 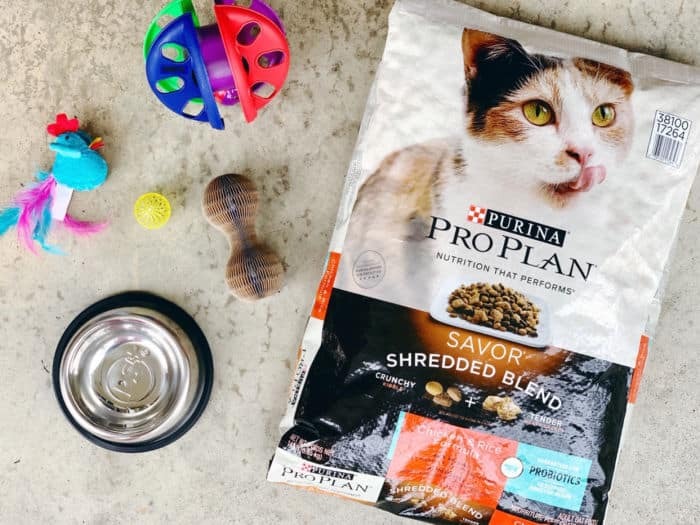 You can give it a try and save money by heading over to grab the buy a Purina® Pro Plan® SAVOR® dry, get $10 back* offer ! I’d say our guys were happy with their new treats, wouldn’t you? So far they are loving their new cat food too and we’ll be adding a little more each day. As for the toys, well they definitely have a favorite! Do you spoil your pets during special holidays?